Halo Headlights (ColorfulLight). LED Headlight. LED Light Bar. LED Light Bar Wiring Harness. LED Quantity: 4(Pure White 6000K). We will reply in 24 hours and fix the problem. pls note this before you order. Jeep Wrangler LED Headlights Halo RGB Angel Eyes are made with the newest design creating unlimited color options and functions to customize your Jeep for an unique look! 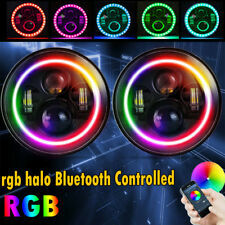 7" RGB Headlight with Halo Angel Eyes for Jeep Wrangler. Jeep Wrangler TJ Unlimited / LJ (2003-2006). Jeep Wrangler TJ (1997-2006). Jeep Wrangler JK 2 Door (2007-2015). Jeep Wrangler JK 4 Door Unlimited (2007-2015). Wrangler JK Models reqiure H4-H13 adapter. Halo Headlights (ColorfulLight). LED Headlight. Headlight Type: 7" round. LED Light Bar. LED Work Light. LED Quantity: 4(Pure White 6000K). Land Rover Defender 90 & 110. Jeep Wrangler JK 4 Door Unlimited (2007-2016). 07-16 Jeep Wrangler Unlimited JK 4 Door. 07-17 Jeep Wrangler JK 2 Door. ▲Newest Design: Full Angel Eye Headlights. ▲DRL Angel Eyes / Hi and Lo Dual Function. 04-06 Jeep Wrangler LJ Unlimited. 07-16 Jeep Wrangler LJ Unlimited. Led Chip Manufacturer LED. Bulb Type LED. LED Quantity: 4(Pure White 6000K). Newest Fantastic Design LED Headlight replaces original halogen and HID headligh. Our goal is to make your choice easier and save your money. Luminous Flux: 4800LM@high beam, 3200LM@low beam. 7" Universal Round LED Headlight Bulb replaces original halogen and HID headlight, Maintenance Free,Newest Fantastic Design LED Headlight With DRL replaces original halogen and HID headlights. Amber is for turn signal; white is for DRL. Luminous Flux: 5700LM High Beam & 3300LM Low Beam. LED Power:75W. Simple installation - Plug & Play & LED Canbus & H4/H13 Adapter - Usually in 20 minutes or less. H4 headlight bulb. H1 headlight bulb. Led headlight bulbs. H3 headlight bulb. H7 headlight bulb. H8/H9/H11 headlight bulb. H13 headlight bulb. 9004 Headlight bulb. Power: 60W. 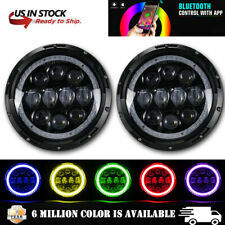 7" Led Headlights Halo For Jeep. 7" Universal Round LED Headlight Bulb replaces original halogen and HID headlight, Maintenance Free,Newest Fantastic Design LED Headlight With DRL replaces original halogen and HID headlights. Jeep Wrangler TJ (1997-2006). Jeep Wrangler TJ Unlimited / LJ (2003-2006). Jeep Wrangler JK 2 Door (2007-2016). Jeep Wrangler JK 4 Door Unlimited (2007-2016). Halo Headlights (ColorfulLight). LED Quantity: 4(Pure White 6000K). Power: 75W. 1976 - 1986 Jeep CJ-7. 2 PCS H4 to H13 Adapter. Certifications: DOT, CE, RoHS, IP67. Plug & Play, H4/H13 Adapter Included. Low Power Consumption, Life Span: 50000Hrs. 45w LED create the perfect light for your vehicle with sealed beam light system, better & more durable than hid kits, simply change your headlight out. LED Headlight. Car Led Headlight Kits. Motorcycle Led Headlight. M998 Suzuki Samurai,Ford Bronco,Chevy Blazer,Subaru Impreza. Newest Fantastic Design LED Headlight with DRL & Turn Signal replaces halogen & HID headlight. LED Headlight Equipped Models will require Factory Halogen Headlight Buckets for Use. (07-'14 Jeep Wrangler Unlimited JK 4 Door. 07-'14 Jeep Wrangler JK 2 Door. 04-'06 Jeep Wrangler LJ Unlimited. 97-06 Jeep Wrangler TJ. 81-'85 Jeep CJ-8 Scrambler. 76-'86 Jeep CJ-7. 4) Housing Color: Black. Jeep Wrangler TJ (1997-2006). Jeep Wrangler TJ Unlimited / LJ (2003-2006). Power: 60W. Jeep Wrangler JK 2 Door (2007-2016). Jeep Wrangler JK 4 Door Unlimited (2007-2016). Halo Headlights (ColorfulLight). 2007 - 2016 Jeep Wrangler Unlimited JK 4 Door. 2007 - 2017 Jeep Wrangler JK 2 Door. Headlight Material:Diecast aluminum housing. 2004 - 2006 Jeep Wrangler LJ Unlimited. 2007 - 2016 Jeep Wrangler LJ Unlimited. Led headlight. H1 headlight bulb. H3 headlight bulb. H4 headlight bulb. H7 headlight bulb. H8/H9/H11 headlight bulb. H13 headlight bulb. 9004 Headlight bulb. The Halo has preset static colors and patterns to dazzle the crowd. Integrated cooling system with large rear cooling ribs for optimized heat dissipation. Quantity: 2PC. Lifespan: More than 50000 hours. Color:75W HEADLIGHTS FOG TAIL. 2007 2008 2009 2010 2011 2012 2013 2014 2015 2016 2017 2018 Jeep Wrangler JK. 2007 2008 2009 2010 2011 2012 2013 2014 2015 2016 2017 Jeep Wrangler JK Rubicon Unlimited. 2015 2016 Jeep JK Willy. Newest Fantastic Design LED Headlight With Half Halo Angel Eyes DRL replaces original halogen and HID headlight, Maintenance Free. Light Patterns: White color for DRL, Amber color for turning signal. H4 Plug-pre-fitted. No buckets included, must use your existing buckets. H4 anti-flicker adapter. This is an excellent choice for almost all your vehicle headlighting needs. They fit most of headlights bucket without modification. 07-'17 Jeep Wrangler Unlimited JK 4 Door. 07-'17 Jeep Wrangler JK 2 Door. 04-'06 Jeep Wrangler LJ Unlimited. 97-06 Jeep Wrangler TJ. Jeep Wrangler LED Headlights Specifications 81-'85 Jeep CJ-8 Scrambler. Jeep Wrangler TJ Unlimited / LJ (2003-2006). Jeep Wrangler TJ (1997-2006). Jeep Wrangler JK 2 Door (2007-2016). Jeep Wrangler JK 4 Door Unlimited (2007-2016). Jeep Wrangler LED Headlights Halo RGB Angel Eyes are made with the newest design creating unlimited color options and functions to customize your Jeep for an unique look! 2007 - 2017 Jeep Wrangler Unlimited JK 4 Door/ Unlimited JK 2 Door. 1997 - 2006 Jeep Wrangler TJ. 2007 - 2017 Jeep Wrangler JK. Plug & Play, H4 to H13 Adapter Included. 2 H4 to H13 Adapter. 2 H4 Anti Flicker Decoder. JK headlight. JK accessories. 2007 - 2016 Jeep Wrangler Unlimited JK 4 Door. 2007 - 2017 Jeep Wrangler JK 2 Door. Jk Brackets. LED Work Light. Square LED Work Light. LED Light Bar. 2pcs H4 to H13 conversion adapters. 2pcs H4 Anti flicker harness. 2pcs Jeep Wrangler headlights. H4 wiring harness for anti flicker error free. H4 to H13 for the conversion adpter. Led Beam TypeCombo. Luminous Flux: 4800LM@high beam, 3200LM@low beam. Jeep Wrangler LED Headlights. Connector: H4/H13 (Ground and High Beam). 7" Universal Round LED Headlight Bulb replaces original halogen and HID headlight, Maintenance Free,Newest Fantastic Design LED Headlight With DRL replaces original halogen and HID headlights. LED Headlights. 2007 - 2016 Jeep Wrangler Unlimited JK 4 Door. 2007 - 2017 Jeep Wrangler JK 2 Door. Jeep Series. 2004 - 2006 Jeep Wrangler LJ Unlimited. 2007 - 2016 Jeep Wrangler LJ Unlimited. 1997 - 2006 Jeep Wrangler TJ. 2004-2006 Jeep Wrangler LJ Unlimited. 2007-2017 Jeep Wrangler Unlimited JK 4 door. 2007-2017 Jeep Wrangler JK 2 Door. 1997-2006 Jeep Wrangler TJ. Jeep CJ-5 CJ-7. Simple installation - Plug & Play & LED Canbus & H4/H13 Adapter - Usually in 20 minutes or less.Newest Fantastic Design LED Headlight With High. 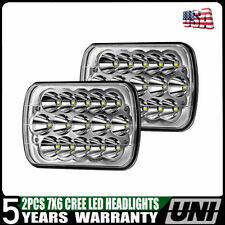 This is a pair of 6014/6015/6024 7" LED Sealed Hi-Lo Beam HEADLIGHT. These headlights are also generally known as 7" Round Projector Headlights that are suitable for any application utilizing the H6014/H6015/H6017/H6052/H6024 PC lens sealed beam headlights. 880 LED Fog Light Bulbs. 881 LED Fog Light Bulbs. LED Light Bar. H8 H9 H11 H16(JP) Led Car Bulb. H16(EU) 5202 2504 Led Car Bulb. H1 Led Bulb Conversion Kit. H4 9003 HB2 Led Car Bulb. 7" Led Headlights Halo For Jeep. JK headlight. Jeep Wrangler JK 2 Door (2007-2016). Jeep Wrangler JK 4 Door Unlimited (2007-2016). JK fog lamp. JK brake lights. JK tail lights. JK Grilles. JK light bar. LED Light Bar. LED Work Light. LED Fishing Light. LED Side Marker. LED Strobe Lights. LED Tail Lights. 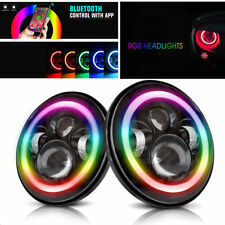 Car Led Light Series. Interior led. Jeep Wrangler JK 2 Door (2007-2016). Jeep Wrangler JK 4 Door Unlimited (2007-2016). LED Work Light Bar. 3D LED WORK Light. 4D LED WORK Light. Halo Headlights (ColorfulLight). LED HEADLIGHT BULB. LED headlight bulb set. 60w Headlights 30w Driving Lights Turn Lights. For '07-'14 Jeep Wrangler Unlimited JK 4 - door. For '07-'14 Jeep Wrangler JK 2 Door. 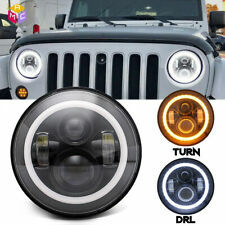 Type: Jeep LED Headlight With Halo Angel Eyes/DRL,Amber turn lights/Fog lights. 2007 2008 2009 2010 2011 2012 2013 2014 2015 2016 2017 Jeep Wrangler JKU. 2010 2012 2014 2015 Jeep JKU Wrangler Sahara. 2011 2013 2016 2017 Jeep Wrangler JKU Sport. Type: Jeep LED Headlight With White Halo Angel Eyes. 75W LED lights has low beam, high beam and DRL function. This is an excellent choice for almost all your vehicle headlight needs. They fit most of headlights bucket without modification. Jeep Wrangler TJ Unlimited / LJ (2003-2006).